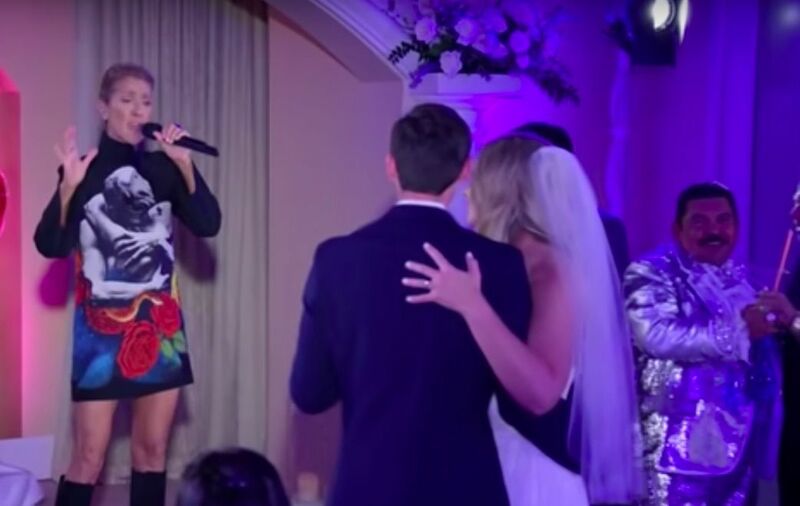 Jimmy Kimmel wrapped up his week-long run of late-night shows from Planet Hollywood in Las Vegas on Friday, and was joined by a very special guest: Celine Dion, who helped him execute a sweet surprise on a bride and groom in a nearby wedding chapel. With Kimmel officiating the ceremony via video, everything proceeded somewhat normally until he got to the part of the nuptials asking if anyone knew of any reason why the couple should not be married. As soon as Kimmel uttered the words “speak now or forever hold your peace,” comedian David Spade burst through the wedding chapel doors, sipping from a ginormous cocktail. “I’m just so lost,” said Spade as he joined the couple onstage, and he did have an objection. “They seem a little too sober, and not on my watch in Vegas,” he declared, with which Kimmel sidekick Guillermo, clad in a shiny silver suit, entered the chapel bearing a tray of tequila shots. They did not. “Well, thankfully I know a local singer who’s agreed to help you out… Ms. Celine Dion,” said Kimmel as the doors opened and Dion stepped out of a cloud of smoke, serenading the couple with her hit “Because You Loved Me”. Dion later joined Kimmel on his couch, where she discussed the efforts that went into the sweet surprise, and also chatted about ending her 16-year run in Las Vegas, her upcoming world tour, her children, and how Ryan Reynolds persuaded her to sing in “Deadpool 2”.